Prints changed the history of art, even as that history was first being written. In this study, Sharon Gregory argues that this reality was not lost on Vasari; she shows that, contrary to common opinion, prints thoroughly pervade Vasari's history of art, just as they pervade his own career as an artist. This volume examines Giorgio Vasari's interest, as an art historian and as an artist, in engravings and woodblock prints, shedding new light not only on aspects of Vasari's career, but also on aspects of sixteenth-century artistic culture and artistic practice. It is the first book to study his interest in prints from this dual perspective. Investigating how prints were themselves more often interpretive than strictly reproductive, Gregory challenges the long-held view that Vasari's reliance on prints led to errors in his interpretation of major monuments. She demonstrates how, like Raphael and later artists, Vasari used engravings after his designs as a form of advertisement through which he hoped to increase his fame and attract influential patrons. She also explores how contributing illustrations for books by his scholarly friends, Vasari participated in the contemporary exchange of intellectual ideas and concerns shared by Renaissance humanists and artists. 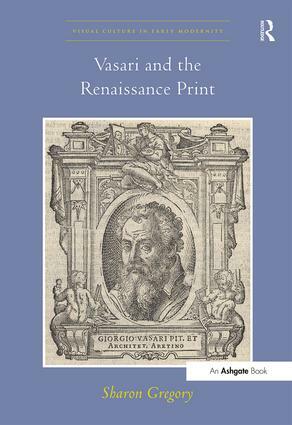 Contents: Preface; Introduction; Vasari and the history of printmaking; Vasari and the illustrated book; Vasari's use of prints as aides-mémoires; Prints in the artist's workshop; Vasari, prints and imitation; Prints after Vasari's designs; Appendix; Bibliography; Index. Sharon Gregory is Associate Professor in Art History and Erasmus Chair in Renaissance Humanism at St Francis Xavier University, Canada. A forum for the critical inquiry of the visual arts in the early modern world, Visual Culture in Early Modernity promotes new models of inquiry and new narratives of early modern art and its history. We welcome proposals for both monographs and essay collections that consider the cultural production and reception of images and objects. The range of topics covered in this series includes, but is not limited to, painting, sculpture and architecture as well as material objects, such as domestic furnishings, religious and/or ritual accessories, costume, scientific/medical apparata, erotica, ephemera and printed matter. We seek innovative investigations of western and non-western visual culture produced between 1400 and 1800.